The dinner menu may be gone, but this stylish, trendy club is still one of OC's hottest. 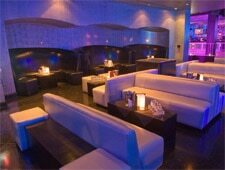 : Sutra is no longer featuring the dinner service it once offered to the club-going clientele. Yet, despite the absence of cuisine, Sutra still remains one of the hottest clubs in Orange County, as its modern space festooned with black-leather banquettes, low sofas, and a killer sound system make it a solid place to grab a cocktail and enjoy the night.